SHARE Wine is fine. 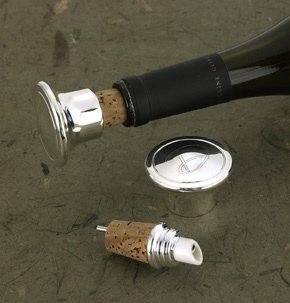 Protect any investment in a wine collection with this combination bottle stopper/pourer that will keep their favorite vintage fresh until the next pour. This piece is would be an elegant addition to any home bar or kitchen set and can be personalized with a single initial. Makes a great gift for wedding party members, etc. Engraved with a single initial, this brass gift is silver plated and measures 2-3/4" by 2".